Categories: Audio plugins & tools, Game Audio Packs & Bundles, Sci-Fi, User Interface (UI). • All shorter sound files include multiple iterations, providing you with plenty of options all within the same sonic family. No more searching for a whole new file or manipulating that one great sound when you need to introduce subtle variations. • All longer sounds loop seamlessly. No need to spend precious time finding the exact right place to create a loop. INTERNATIONAL AWARD-WINNING BOOM BOX POST NOW BRINGS YOU BOOM BOX LIBRARY, A SOUND EFFECTS LIBRARY COMPANY DEVOTED TO CREATING HIGH-QUALITY PROFESSIONAL SOUND LIBRARIES AND CORRESPONDING CUSTOM-PROGRAMMED SOUND DESIGN TOOLKITS. Our award-winning sound designers work every day in the post-production sound industry. So, we know exactly what working professionals expect in a sound effects library. We are creating libraries that we ourselves want to use. 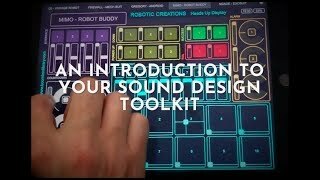 Each collection we publish comes with a custom-created sound design toolkit which will take your design work to the next level by integrating our sound effect libraries with software such as Kontakt and TouchOSC. These integrations allow you to intuitively modulate aspects of the sound such as pitch and speed in real time with the simple touch of a finger or swipe of a hand.